Awesome piled up jewellery. Makes me want summer to go on and on! Love it.. Now I want summer! Wow awesome, awesome styling! The model is also utterly beautiful! Such a cute collection! Absolutely gorgeous outfits.. 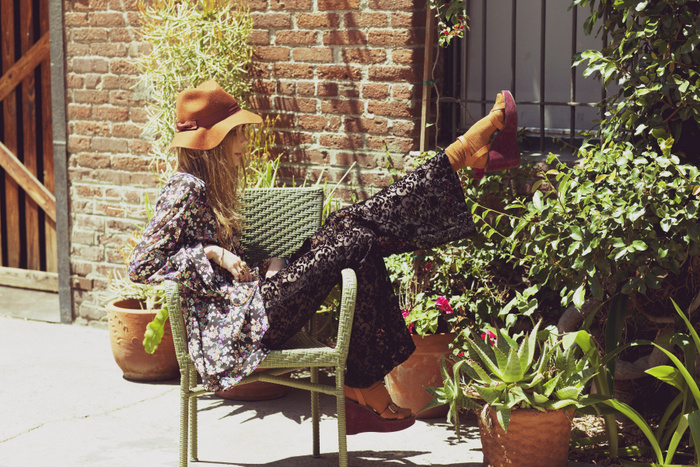 I love the boho styling and that hat makes the outfit!! I love every single pic you're posted! love the floral print dress and shorts! So many great pieces in this collection. I was just looking at a few the other day in the store. I cannot beside what to buy. nothing short of PERFECTION. in love with this. There are a lot of great looks here, reminds me a lot of Free People and the boots are AMAZE! This is just breathtaking. I love her dark, smokey make up and that she's just completely drenched in jewelry. Eye candy. I love the clothes and the photoshoot!